The YoyoFactory Replay pro is the best cheap unresponsive yoyo manufactured by YoyoFactory which provides great value for the price. The yoyo was designed by Gentry Stein who won the 1A Open Division of the World Yo-Yo Contest in 2014 with the YoyoFactory Shutter. Gentry even managed to win the 2015 Us Nationals with this inexpensive yoyo. What makes it so special? Let’s see its main characteristics! Construction and Shape-what makes this yoyo different? 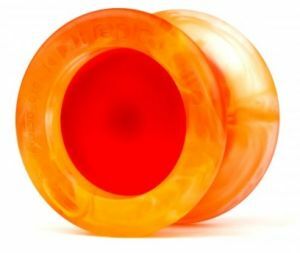 The YoyoFactory Replay Pro has a regular butterfly/H-shape that makes the yoyo design so elegant. The polycarbonate moulded halves can stand hits pretty well. Unfortunately, it hasn’t any fingerspin cup (because they are circular discs)so you can hardly do such things. This yoyo is heavier than most of the plastic yoyos, even the metal ones at a staggering 69g weight(far more than the average of 64-65g yoyo). The axle is also longer than the average 8mm one (from my observations it is around 20 mm in length, its role is to improve the link between the two halves of the yoyo). Gentry Stein and the YoyoFactory team had managed to bring the 3 main characteristics a yoyo must have to be competitive: spin time, stability and catchability on the string. Most of the yoyos at that time lacked one of these characteristics and that was most often the stability. Unlike the YoyoFactory North star, the Replay doesn’t come with aluminium spacers, the bearing seat itself is moulded within the yoyo structure. The yoyo still has great performance even with these modifications. Playability and feel-keep on playing with the Replay Pro? From my perspective, the yoyo feels extremely comfortable onto my hands. The spin time is great as long as I maintain the bearing properly, so I can perform longer tricks and still have the yoyo spinning. The yoyo is able to handle any kind of 1A trick you throw at it, the horizontal tricks work as well, but you will find a bit tough to start off in this area. Don’t worry too much though. If Gentry Stein can pull it off, well, you can make it too with practice. When I do tricks with the Replay Pro, something annoys me about it. The shape is a bit too narrow and the slopes are close to one another. This affects somehow the stability (don’t get me wrong-the yoyo is still stable when let spinning). However, Gentry Stein doesn’t seem to be bothered by the impediment. The thing is when I pull one string towards myself or to another direction, the string tends to rub the smooth polycarbonate surface and influence the way the yoyo spins (it tilts a bit too much for my taste). However, this is manageable, and I can go on with this problem without much concern. Come on! I only paid 16 bucks for this yoyo. Another thing to be mentioned is the finger grind design. Goes on fairly well but the polycarbonate doesn’t offer so much spin time in regard to this style of playing. The thumb grinds may work, but the yoyo in;t designed for this kind of trick. Still, it is 16 dollars! The YoyoFactory Replay Pro is a great throw for both beginners and professional players. For its price, it accomplishes great things in terms of design and playability. 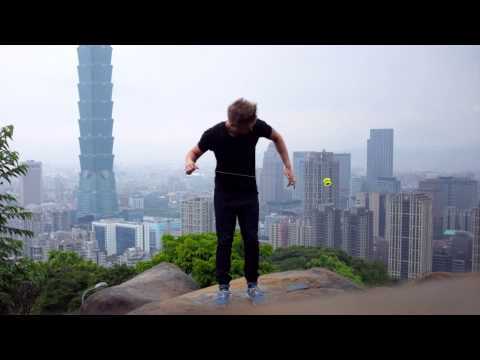 This is a yoyo you should definitely try out! You won’t regret any dollar spent on it! Any questions or suggestions? Ask them into the comments section!